I finally got my hands on the tool accessories needed to turn a pen(cil). 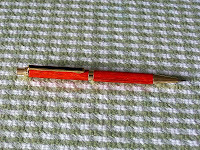 So using a scrap cutoff of padauk, I went to town and made this beautiful padauk mechanical pencil, with gold plated trim and a black stripe on the clip. Wait, what accessories were needed? 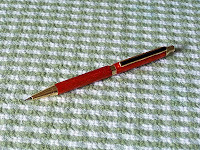 Pen mandrel to fit your lathe. Yep. That's it. The mandrel is $9.99 at Woodcraft Item 141469. 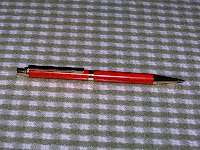 Pen kits are around $5 at all the usual vendors. I got a pencil kit at Woodcraft. Another thing you may find useful is a barrel trimmer. this squares the end of the turning blank to the newly inserted brass tube. Keeps things neat and tidy. Mine was $20 at Woodcraft. All that is left is to make the pencil! I took a scrap piece of padauk and cut it into 4" sections. Two of those sections I put into the drill press and put a 7mm hole through them to hold the brass tubes. I then pressed the tubes into the wood with a drop of CA glue ("super glue") to hold it together. Then I mounted the whole thing on the turning mandrel with a bushing on either end, and one in the middle between the blanks. 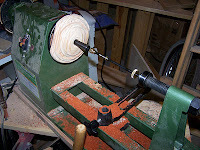 After tightening things up and mounting the mandrel to the lathe I was ready to turn. Too bad my craptastic Harbor Freight lathe wasn't compatible with the mandrel! I knew it had a "morse taper #2" fitting. But it didn't occur to me to check that the fitting was in the headstock... The part that turns. The fitting is only in the tailstock in the cheap 40" lathe. 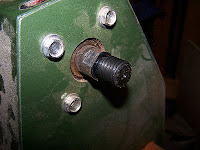 The tailstock doesn't turn, so the mandrel wouldn't turn. I had to find a way to get the mandrel MT2 base into the headstock. I had a faceplate that was separated from a mug I made that I hadn't cleaned up yet. There was enough meat on the wood there to carve out a MT2 hole for my mandrel to rest in. Once it was carved out, the arbor fit nicely. My live tailstock (a MT2 spinner) was tightened snugly into the dimple on the end of the mandrel and I fired up the lathe. All that was left was to start cutting the wood! 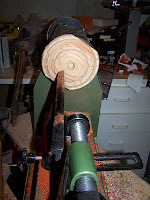 I started off gently removing wood because of the thin diameter of the mandrel. I was afraid it would start bowing under any pressure. It turns out that my fears were unfounded. It's very rigid and does not bow under normal cutting pressure. 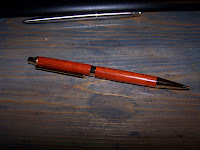 The pen blanks were turned with a 5/8" spindle gouge and finished with a 3/4" skew chisel. I got such a great finish I was able to sand starting at 600 grit! A pass at 600 and a pass at 2000 got me a nearly mirror finish all by themselves. I then applied some thick CA glue for a finish. If you're applying super glue for a finish, don't worry about slopping it on the bushings and such. The pieces will pop right apart and the CA glue will be removed the next turning session. I got the blanks out and started assembling the pencil. The package for the pencil kit didn't explain what parts went where. It took some trial and error to get things where they belonged. I'm sure once I've done a few of these the positioning will make sense. Until then, I'll have to pay extra attention to the order the pieces are assembled. As you can see, the results were awesome! I'm really happy and want to make more! Lots more! BWAHAHAHAHAHAHA!!! Thank God for this post. I'm in Harbor Freight pen turning hell right now. Tonight I will use your faceplate trick.